﻿ Lorena Sternwheeler - Ohio. Find It Here. 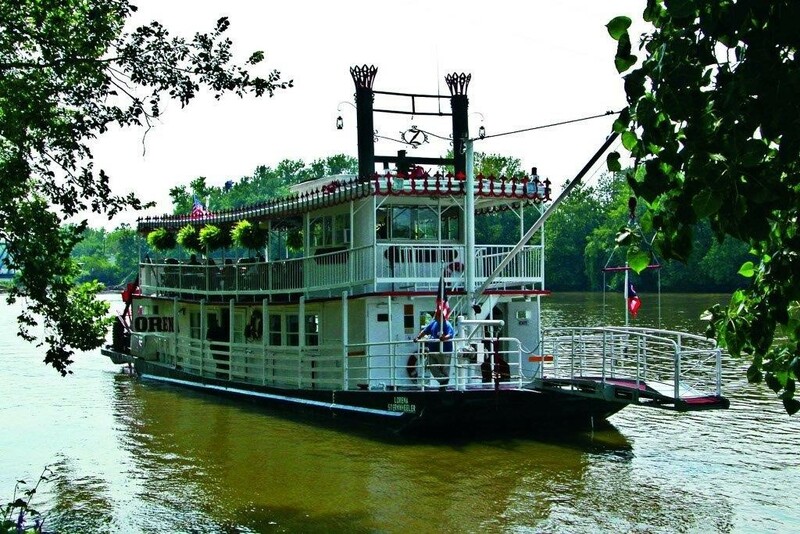 The Lorena Sternwheeler is moored at Zanes Landing Park at the west end of Market Street in downtown Zanesville and offers excursions on the Muskingum River. She can carry 75 passengers and is 104 feet long, 17 feet wide. The hull is 68.5 feet and draws 2.5 feet of water. The Lorena weighs over 59 tons and is available for public rides, dinner cruises, birthday parties, anniversaries, lunch cruises, twilight cruises, and charters. This Muskingum County treasure travels up the Historic Muskingum River Water Trail and offers a relaxed and pleasant ride through wide waters, passing scenic woodlands just the way our ancestors did. She has carried governors, Miss Americas, Pat Boone, and the Imperials. Newspapers throughout the world write about the Lorena and radio and TV coverage is extensive. Worldwide coverage came when the Lorena survived the Blizzard of 78. The riverboat was within a quarter-inch of capsizing. Public Rides and Twilight Cruise: $8 adult, $7 senior, $4 for children ages 2-12. No reservations required, tickets can be purchased at the boat.